We know that dealing with environmental and regulatory compliance can seem complicated; itʼs our job to make it simple. 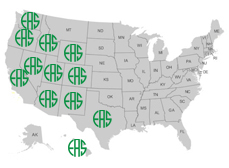 Environmental Assessment Specialists, Inc. (EAS) provides environmental consulting services throughout the western United States to businesses in the telecom, financial, real estate, and other industries. We offer expertise in a broad range of fields, which means that we can develop solutions designed to best serve your specific industry needs. And we keep it streamlined for you by having just one of our dedicated managers as your point of contact. Founded in 1992, EAS is a team of Registered Environmental Professionals (REA), project managers, seasoned administrative support staff, and a network of specialists who can handle a wide range of environmental consulting, compliance, planning and management tasks. EAS will provide the right specialists for your company's needs. Contact us today to see how we can make your job simpler.